-Each bottle is securely cradled. -Easy to Assemble, takes minutes. -Perfect for at home wine collections. -Great as a gift to you or your friends. -Unfinished wood gives option to stain, paint, varnish or leave as is. -Sturdy design, wobble-free, interlocking joints for maximum stability. -The clever design allows easy assembly (no tools required), and folds flat when not in use. 【Overall Dimension】Approx.47"(L) X 11.8"(W) X 27.5"(H). Holds up to 72 bottles (6 layers & 12 bottles each layer), 3.5 inch opening will hold standard size wine bottle (750ML). 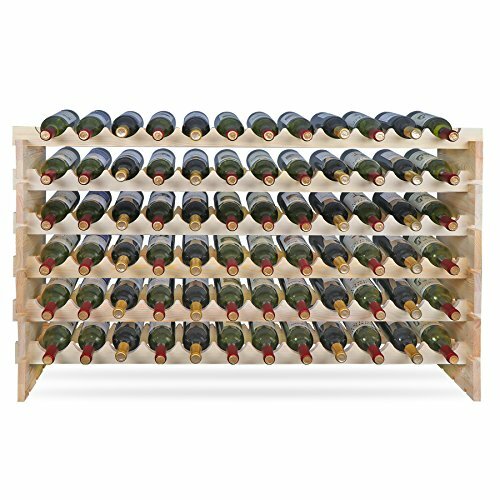 This wine rack holds all different sizes bottles, top tier could holds your favorite champagnes! 【Sturdy & Wobble-Free】Made of high quality pine wood to ensure sturdy construction and large capacity.The thinckness of this hardword is 18mm, smooth and durable material to ensure your wines safety. 100% wobble-free guarantee! 【Thoughtful Design】Versatile modular stacking style,wave shaped shelves,arc design prevent wine bottles scattered around dowel pins to inter lock each connection point.Unfinished wood gives option to stain, paint, varnish or leave as it is. 【Minimal Assembly Required 】Each piece of wood has slots and either a dowel or a hole so they can fit together well. Easy to put together without any tools,all accessories are included in the package, as well as detailed instructions. 【Excellent Wine Rack & Service】 Classic design to accent any home, kitchen, dining room, or wine cellar. Also makes a great gift for any special occasion. Wine collectors will definitely love this wine rack! Got a defective or broken? Contact us to get parts replacement! 1 year warranty.